Broadcast on Channel 5 (UK) 15 June 1997 Sun 4:40 a.m. Officer Barry tells Chrissie she had morning sickness herself "right up the fourth month", which is a strange way of putting it if she really did have the abortion she later claims to have had. Erica tells Jim that a work party from the men's prison will be repairing the fence, so she hopes to keep them away from the women to avoid any further pregnancies. Chrissie is taken to see the doctor, though Vera refuses Pat permission to see him too. Erica tells Meg that Chrissie was transferred from Barnhurst for "playing around", but is confident Chrissie is trying to get isolated from the other women. Greg confirms that Chrissie is pregnant, and asks her what she plans to do: she says she wants an abortion. Erica calls for extra security during visits so that the news of Chrissie's pregnancy doesn't get leaked to the press before the Department can hold an enquiry. Karen visits Doreen again, and at the end of the interview gives her the message from Angela to Pat that both Greg and Erica have already refused to pass on - her son David will be in the work party. Jim warns Doreen that passing on the information would threaten her parole. Bea and Lizzie find Officer Barry guarding the door of Chrissie's cell and Bea issues a few veiled threats, knowing Chrissie is listening. After agonising for a while and overhearing Pat talking about her family to Ros, Doreen does tell Pat that David is coming to Wentworth. Greg wants to make sure that Chrissie doesn't make a hasty decision about having an abortion and arranges for her to work in maternity. Pat asks to be allowed to work in the garden, but Erica refuses. Chrissie has morning sickness, and Pat follows her to the shower block and realises she is pregnant when she overhears Chrissie's conversation with Officer Barry. Pat persuades Bea she has to lay off Chrissie, and Bea agrees if Pat can talk Chrissie into keeping the child. Jim catches Pat trying to sneak into maternity to talk to Chrissie. Bea remembers there is a window in maternity overlooking the garden. Doreen causes a diversion by pretending to have a "turn" (cue ridiculous mugging ) so that Bea can talk to Chrissie in the shower block. Chrissie lets Pat into maternity and stands guard, but she is called away to the Governor's office by Jim. 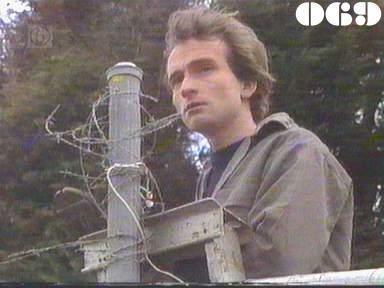 Pat waves to David who just happens to be standing on a stepladder cutting the barbed wire at the top of the fence . He hops over the fence and runs to the maternity window to talk to her. She tells him she is only divorcing his father so she will get her parole and be home to see the kids for Christmas. Vera catches them together and tells Pat that she won't see her other children at Christmas as she's unlikely now to get her parole.